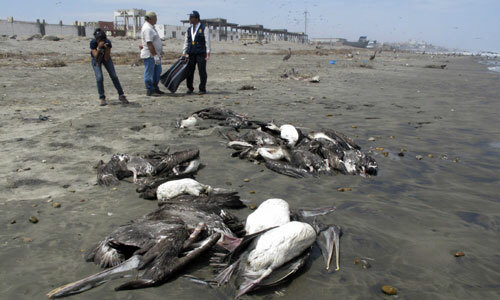 About 5,000 pelicans and other ocean birds have been washing up on the northern coast of Peru, just weeks after over 900 dolphins perished in that same area. In total, reports EarthWeek, about 3,000 marine mammals have died off in the area this year, in what scientists are linking to seismic testing for oil offshore. Peruvian officials have declared a health alert and urged beachgoers to stay away from the affected area. Scientists are still, however, searching for a definite cause, and have a few theories on why the birds, in particular, died. One of the most probable, they believe, is that increasing ocean temperatures have pushed a species of anchovy deeper into the sea, where young pelicans are unable to reach them, and thus unable to eat. Strangely, however, there have also been a number of dazed and disoriented pelicans seen standing on beaches they don’t normally frequent. Others still have been spotted walking aimlessly along coastal roadways. But as the scientists continue to look into the dolphin deaths, meanwhile, they say it remains mysterious and troubling, and added that the government was remarkably slow in investigating the situation. Carlos Bocanegra, a biologist at the National University of Trujillo, commented that ocean temperatures in the region are 10 degrees above normal for this time of year. He pointed out that similar die-offs happened between 1982 and 1983, and again between 1997 and 1998. During both times, he noted, the El Nino meteorological phenomenon had caused ocean warming. Some local residents aren’t buying it, however, said EarthWeek. Many say they have never seen anything like the current influx of wildlife deaths and that, despite claims of warmer waters, fear offshore oil exploration is a huge cause in the disturbance, confusion, and death of marine life. Some also believe pesticides and chemicals could be finding their way into the water. He lives in Illinois and frequently visits his home state of New Jersey. He likes cats, red wine, books, music, and nature. 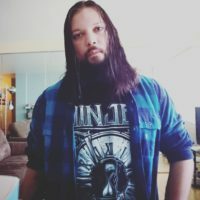 In his spare time, he is writing a novel and working on art.